Have you ever been to a party with that guy? You know the one. 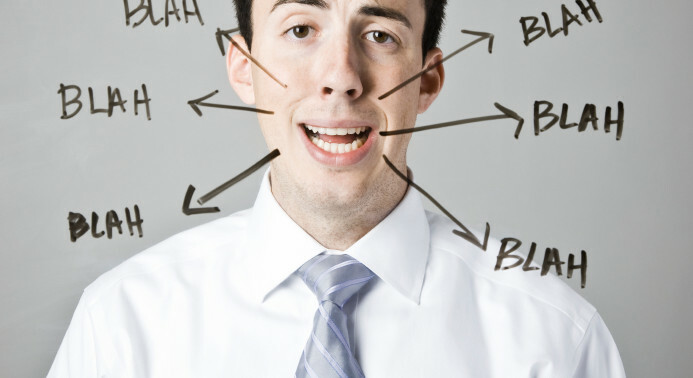 Blah, blah, blah. On and on about stuff no one cares about. The same kind of thing happens with Facebook Pages. If you’re continually posting about stuff and your fans aren’t engaging with the content, you run the risk of getting tuned out. The kicker is that Facebook takes care of the dirty work by removing you from the news feeds of people it thinks would rather not be bothered by you — even though they’ve “Liked” your Page! So to get the most from your Facebook Page you need to walk the very fine line of posting regularly AND not annoying anyone. So what’s the ideal posting frequency? And how can you make sure your Page isn’t treated like that guy? Eventually, if the annoying stuff outweighs the cool stuff, you slowly start to disappear from your fans’ news feed altogether. Now, I’m no math genius, but by my calculations, that means you don’t want to post something just to post something. But you also don’t want to post nothing, as that doesn’t help your situation either. You see, the truth is that there are no hard rules, only guidelines. This is because the answer varies based on who your audience is. Start with the guidelines below and then make adjustments based on what you’re hearing from your fans. (Be sure to check your Page Insights to see what content people are engaging with.) Don’t listen to me or anyone else who tries to give you end-all-be-all advice. At the very least, post once a week. Look for opportunites to post up to once a day. Don’t post unless you have something valuable to say. Luckily, we do know that Facebook weighs certain types of content a bit higher than others. Mainly, this is because the format of the content is more engaging by nature. So think about using a photo for one of your posts, a video for the other, and a link that encourages people to comment. 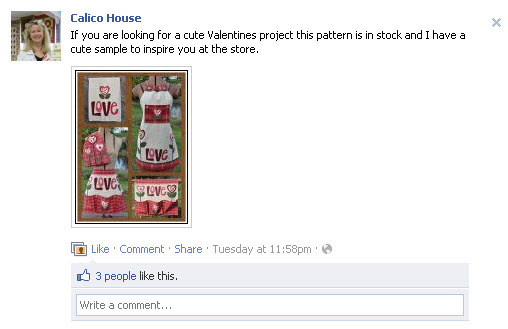 Quilting store Calico House shares photos of its latest fabrics that fans regularly “Like” and comment on. Get your fans to Like, comment on, or share your content. When you do this and people take that action your content moves to the cool side of the room. And that’s exactly where you want to be. Not on the loser side like that guy! Time your posts. Gauge the response and let that help you decide to post more or less. Do give engaging updates to your fans regularly. Don’t bother your fans with content that doesn’t engage, or else you run the risk of falling off the radar. Have any additional questions? Post them in the comments below.